Rolling on a more sustainable, zero VOC paint in Polk Hall. Flashback five years and paint being brushed and rolled on campus walls could be smelled before it was seen. 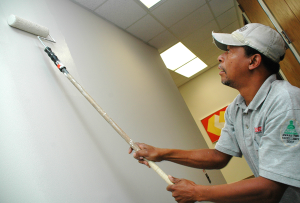 The odor, created by emissions of volatile organic compounds (VOCs), was the hallmark of painting for decades until the recent evolution of low VOC and zero VOC paints, which are now the wall paint of choice for NC State. In addition to trimming paint cost by 24 percent, zero VOC paint has also rolled on health benefits while reducing environmental air quality impacts of paint. According to the Environmental Protection Agency, VOCs – which can be 10 times stronger indoors than outdoors – have been related to health effects such as eye irritation and headaches, as well as other long-term conditions. The change to zero VOC paint has saved NC State money, limited health impacts of paint and improved environmental air quality. 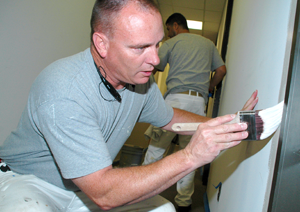 Beyond paint selection, the university’s dozen or so painters also use a special cleaning process that collects excess paint from brushes and rollers, solidifying it so that rinsing paint from these tools doesn’t clog drain pipes or contaminate water. They also keep and reuse extra paint and paint buckets when possible and consolidate driving across campus to save fuel. So, next time you walk into a freshly-painted campus building and can’t smell the difference, that’s another example of sustainability at NC State in action – saving money, improving health and reducing environmental impacts.